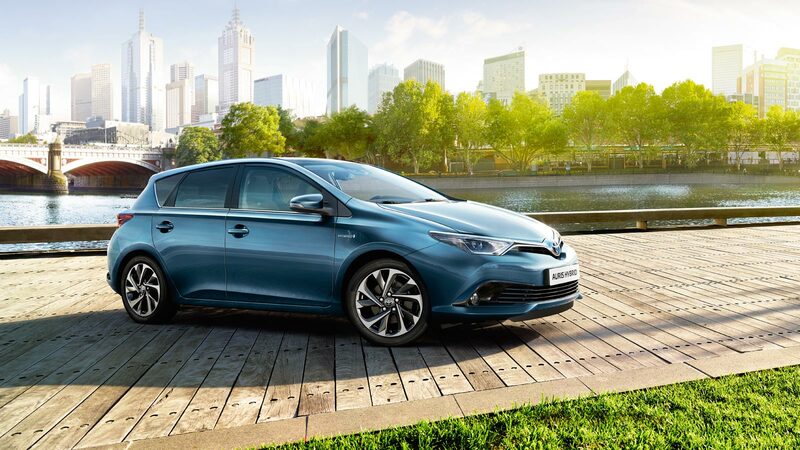 Toyota have launched the 2015 Auris range combining hatchback and touring sports body styles with a choice of diesel, petrol and hybrid powertrains, and increased levels of specification. The 2015 Auris has been designed to meet the needs of every C-segment customer model range, and is available from only €20,750. The front and rear of the Auris have been comprehensively redesigned to give the vehicle a visually broader stance and a more prestigious, sophisticated road presence. To the front, paired chrome wings are generated from the new, more prominent Toyota logo. Underscoring the front lip of the bonnet, the powerful upper wings run the full width of the car. The less prominent lower wings sweep down into the upper surface of the front bumper, holding the sharply-angled inside edge of new LED headlamp clusters which incorporate LED Daytime Running Lights (DRL). In profile, the new front and rear styling generates longer overhangs, improving the overall balance of the design. This more sophisticated profile is further enhanced by a new shark fin roof antenna and new, 16" and 17" alloy wheel designs. To the rear, the lower half of the Auris has been completely redesigned to once again add visual emphasis to the vehicle's broad road stance. The width of a deeper, more muscular bumper design is emphasised by the placement of reflector lamp housings at the extremities, and underscored by a thin chrome trim line. The driver's instrument binnacle now features a stronger, more sporting design with tubed tachometer and speedometer dials either side of the new 4.2" screen. Within a more curvaceous dashboard design, the centre stack instrumentation has been integrated into a single, smooth surface incorporating touch-sensitive switchgear with more consistent back-lit illumination. Numerous detail elements such as the air vents, door handles and gear lever surround have been redesigned for a crisper, higher quality appearance. New seat upholstery designs complete a more prestigious and sophisticated, premium quality cabin environment. The new 2015 Auris also sees the introduction of a 1.2 litre direct injection turbocharged engine to the petrol line-up with the addition of a new 1.6 litre D-4D unit also. The 1.4 litre D-4D engine has been substantially upgraded and features numerous enhancements to both improve performance and lower emissions .Every engine in the new 2015 Auris range now meets Euro 6 emissions regulations. Auris Hybrid’s remarkably quiet, smooth, relaxed and stress-free driving experience has proven increasingly popular with C-segment customers, and today the Auris is the most sold hybrid in Europe. Offering best-in-class CO2 emissions of just 79 g/km and combined cycle fuel economy of only 3.5 l/100km, customers can enjoy significant tax incentives and exceptionally low running costs. The Auris grade structure has been revised to bring Hybrid grades (Terra, Luna & Sol into line with the rest of the model range, and represents outstanding value for money. The new, Auris range benefits from improvements in ride comfort and handling. Numerous measures have been introduced to reduce the transmission of Noise, Vibration and Harshness (NVH) into the cabin and soundproofing has been enhanced through the adoption of additional sound absorption materials. With the Auris already awarded a 5-star rating by the Euro NCAP crash test programme, the new 2015 model range takes active safety and driver assistance to new levels with the optional Toyota Safety Sense pack. Processing information provided by a compact, windscreen head-mounted unit housing both a laser and a camera, Toyota Safety Sense offers customers a Pre-Collision System , Lane Departure Alert , Auto High Beam and Road Sign Assist. All Toyota Safety Sense status and alert information is displayed to the driver on the instrument binnacle 4.2" colour TFT multi-information screen.